Customer Reviews For "Majesty in a Manger"
"Majesty in a Manger" is one of the most succinct and striking thesis for what Christmas is all about. The titular itself captures judiciously the transcendence of the Christ Child as well as the kenosis act of the king coming as a diaper-wrapped baby. But more than the title, the songs on this new Integrity Music release bear testimony to these two indispensable yet intertwined truths in glorious ways across the album's 11 tracks. Thus, this album gives worship leaders and pastors a thesaurus of Christ-exalting vocabulary to fill our worship this Christmas and beyond. 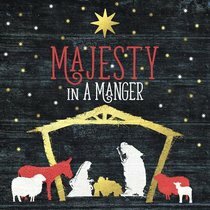 "Majesty in a Manger" is therefore more than just an album for our personal devotions, this is a rich treasure trove that could be use to enrich our church's corporate worship over the festive season. "Majesty in a Manger" is an in-house Integrity Music effort. All 11 songs here are performed by worship leaders who are currently on the imprint's roster. They include Darlene Zschech, Seth  Nirva, Paul Baloche, All Sons and Daughters, Greg Sykes, Dustin Smith, Michael Neale, Travis Ryan, Christine D'Clario, Lincoln Brewster and co-producer Michael Farren. Save for Lincoln Brewster's "O Little Town of Bethlehem," all the 10 tracks here are newly written and newly recorded. This means that there are no recycled Christmas carols, all of which here are worship tunes written with Christ's birth in mind.